Looks like a huge risk… would be one id want to make sure your insurance covers as well. But not for long, lol. I’d be at $3500. If you get it fine, if not so be it. If you’re going to mess with some PITA might as well make it worth your while. Oh I’ve seen some pretty grueling videos where guys get hit with arc flash then walk around empty factories confused trying to find help. Pretty nasty stuff. This is where the power company will “pull” power. 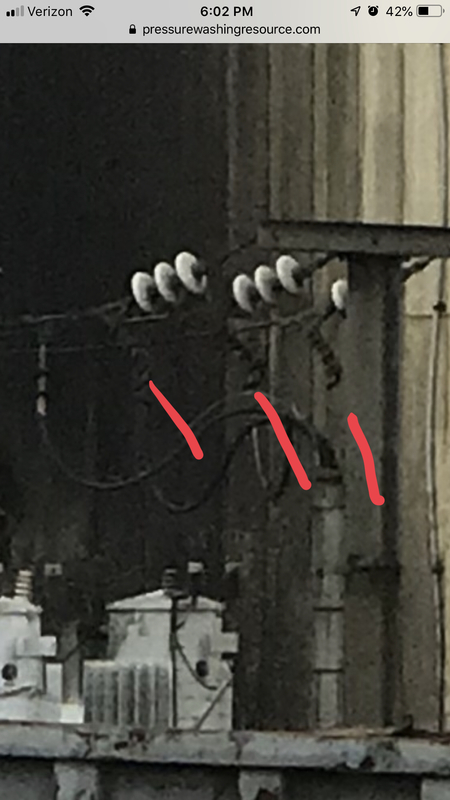 These three “plugs” disconnect the line from the feed. But the power will still be right at these 3 phases. Just not allowed to go through the mini power line. If water were to jump any of these phases you would meet your god! And you can’t tarp or bag them because they would get wet and definitely flash out. I would also make sure you are capable of applying your own LOTO on their system once they shut it down. So I have bought some ebc. Will be first time using it. Would ebc strip the paint off? And the electric company will be standing beside me while I’m washing it. Hoping I’m not going to have to brush it. Its been on there for about 5 months now. Oh so this is happening! Hopefully you got a good price on it! Using a lift? No lift. I am almost positive I can get the ebc up there with my j Rod. But will the ebc take it off? I mean I’m vested in seeing the results now! So the power company is coming to confirm no risk? My goal is to apply with downstream injector, jrod and let dwell until I see it working itself. Then apply until it is gone. Dwell time is key here I bet. Do you have a backup plan if it does require agitation? My other option is to buy a telescopic pole and attach a brush to the end of it. I would mix your spray bottle with the same ratio you’re going to get when down streaming and run another test. You’re talking 50% compared to a 10% mixture. You will then know if you need a backup plan. Check out Patriotspwashing and his pure water system using a battery backpack sprayer and water fed pole. You wouldn’t even have to use a battery backpack but rather a cheap pump up sprayer. You’d be able to hit it with any strength EBC you want. If you scroll down to the 26 post he gives a parts list. Actually, you could probably throw something cheap together without ordering anything. Just get a pump up sprayer and 30’ of 3/16" hose or whatever length and size you need. Cut the pump up sprayer hose, connect the two hoses with a couple hose barbs and zip tie the wand and hose to a pole. Get everything ready, zip tie or tape the wand trigger, and start spraying. You could even throw together a cheap 12v. Exactly… that’s why I went that route in the first place. Now I like the convenience of it. A lot of “window guys” in other forums get mad when I mention that Distilled water has a zero TDS and is the same endstate as filtering water through an RO/DI system.